January 1. We made it to see this day. It’s that pivotal date when all things new are embraced and our efforts at finding that balance which optimizes our lives are keen. There’s so much to be said for the moments that shaped the previous year. We all experienced happy moments, sad times, anxious thoughts, maybe even major transitions — physical or emotional — which steered the way we maneuvered our lives. But still we ended the year with the ability to reflect on all those things. What can we do differently? What can we do better? Is there anything lacking that we can create space for in our routine? Those experiences I listed above are all introspective of my own life. I consistently lived through every one of those emotions, and more. Some I made public, others I quietly dealt with through prayer and a lot of forced dancing. No matter the situation, I always make sure to imply sincere gratitude for all I have. I’ve learned along the way that most feelings, especially the happy ones, are extremely infectious. What they don’t see is the other side. So, when friends and acquaintances asked how manage to execute all of my projects and still maintain a viable level of sanity and that infectious spirit, my answer is usually one based on faith. Coupled with a solid helping of food. For I am an emotional eater. 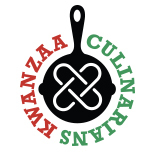 Today, on the last day of Kwanzaa, we celebrate Imani, or faith. I celebrate faith. This year brought a lot of change, all wonderful and some unexpected. I moved back to DC after living and creating a new life in Atlanta for almost 7 years. I prayed about the move for two years but wasn’t convinced it was time to make it happen. And then one day, as they say, it clicked. I took a huge leap of faith and made the decision. In the same manner I leaped 7 years ago to move down to a state I had never lived in, to immerse myself in a southern culture unrelated to my cosmopolitan roots and not having any idea of what would evolve, I had faith that it would all work out. And it did. The transition back to DC has been fair-weathered awesomeness. Some curve balls, some changes but mostly a renewal in my spiritual existence. I didn’t come back with a master plan. I just came with the expectation that everything I had built would remain stable enough to continue standing and growing. It’s now 7 months later and it is. I had complete faith the foundation my parents built would be strong enough to hold the meanderings of my life; and that I would know exactly what to do with a new environment. After all, a lot is noticeably different in this city. The beginning of a new year always invites change. But we can never be 100% certain of what that change will be. We simply have to allow ourselves the gift of faith to let the path take its course. The only thing for certain I know I will do this year is modify my approach to eating. A slight diversion from what I’ve touching on here, but since I aforementioned my emotional eating tendencies, part of the experience in reflecting of things past is acknowledging what worked and what didn’t. The physical move and all that came with it caused the emotional eating. Now that I’ve settled into my new life, I can readjust my eating. It won’t happen overnight. If I thought so, I’d be starting off setting myself up for measurable failure. It’ll happen with commitment, dedication and eagerness. And then, that simple dose of faith in my ability, will ensure the permanent change. See how it all circles back? Happy new year to you and yours. Embrace the new. Fret now but press forward in faith! I share this particular recipe because it’s a departure from what I know of plantains. Having roots in African cuisine, plantains are ubiquitous in Latin and Caribbean food. I have my staple plantain recipes, but this Dominican dish was delicious when I had it in D.R. and has made its way to my own repertoire. Fill a pot halfway with water, put on high heat. While water is heating, peel the plantains. I usually rub my hands with cooking oil to peel the plantains, it really makes washing your hands easier because the oil doesn’t let the stain from the plantains stick on your hands as much. To peel the plantain, cut the ends off of, cut a thin line down each side of the plantain, pull the peel apart, use a pairing knife if the peel is very difficult to pull away. Once the plantains are peeled, for quicker cooking, I cut them in half, then, slice each half in the middle (to get 4 pieces from each plantain). Once all plantains are peeled to in the water (it’s ok if the water is not boiling yet), cover and bring to a boil. When the plantains come to a boil, add a generous amount of salt (a tablespoon is about the amount I add). Let the plantains boil until they are fork tender (about 20 – 25 minutes). Drain ALL of the hot water. While the plantains are hot, add the butter or margarine (I prefer to use margarine), then add the olive oil. Then add the salt. You may adjust the salt level, but I’ve made this recipe too many times to count and I think that 1 tsp is the perfect amount. Now, mash the plantains (don’t add the water yet), this is just to ensure the butter (or margarine) melts and to dissolve the salt as well. After mashing briefly, add 1/2 cup of cold water, don’t ask me why but adding cold water makes the mangu really soft and if you put it in the refrigerator then reheat, the mangu is not hard. It’s an old trick that has been passed down by generations and most of the seasoned Dominican cooks I know mash their mangu with cold water as well (same way my mom taught me). After adding the water, mash some more until the mangu is thoroughly combined. If you are finding that your mangu is still very dry, just add more cold water. Add 1/4 cup more at a time, for me a 1/2 cup is the perfect amount because you don’t want watery mangu. After mashing for a couple of minutes, see how soft and creamy it gets. One of the most popular items that mangu is paired with is sauteed onions and fried salami (there is even a song dedicated this dish called “platano con salami” ￼). If you prefer to serve it as a side dish and omit the onions, it works well with meat, eggs, veggies, cheese, etc. This entry was posted on January 1, 2013 by Bren Herrera in 2012, Imani, Recipe and tagged 2012, Bren, Bren Herrera, Dominican Mangú, flanboyanteats.com, Imani, Latino, MASHED PLANTAIN a lo DOMINICANO, Plantains.